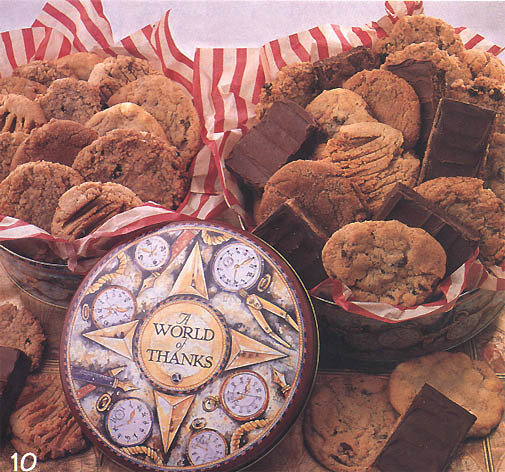 Show a token of your appreciation with a tin of luxurious Cravings cookies and homemade brownies. Timing is of the essence with a thank you. Peanut Butter Brownies, Outrageous Brownies, Double Chocolate Brownies, Chewy Chocolate Brownie, Chewy M & M Brownie, Chewy Walnut Brownie. 1 Mom's Oatmeal Chewies, 2 Cravings Famous Chocolate Chippers, 3 Grandma's Molasses Crinkles, 4 Oatmeal Raisin Walnut, 5 Peanut Butter Gems, 6 White Chocolate Macadamia Nut, 7 Chocolate Chippers with Walnuts, 8 M&M Chocolate Chippers, 9 Heath Bar Crunch, 10 Cranberry Orange Oatmeal Chewie.